Birds Of A Feather: Home Office? Hmmm.... I think I need an office. Hooper has one, a great one right off of her foyer. It's pretty too... a little blingy and high style (shocker!) My "office" is in bags at the bottom of THE ONLY CLOSET IN OUR ENTIRE HOUSE. Our house is old, apparently no one needed to store anything back in the day (or, ummm 1970). Her husband has an office upstairs (a whole room) and Beth's is downstairs in a closet in her kitchen... At the center of it all! And when necessary (dinner party etc...) she can shut the door. It does help that her storage square footage is the same amount as my entire house. Still, if I could sacrifice OUR ONLY CLOSET this would be a great option. Love the wallpaper in the closet, office. But the floating shelves would never give me enough storage! I think I need a whole building... Maybe Jeff would like this in our backyard...it goes with our farmhouse so well...But I do love it. 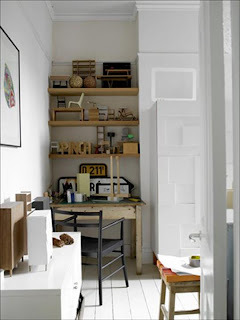 Simple, pretty, raw wood and painted floors...this office is my speed... Until we add on our move, The crammed bags in the bottom of the closet and the back of my car will have to suffice! 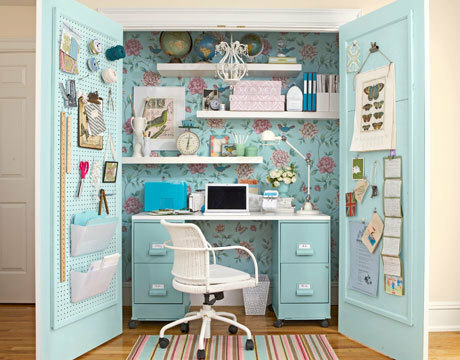 If you're planning to have a home office, I suggest you personalize it by buying office furniture in NYC. You can focus more and be more inspired if your workspace defines you.